While studying the deposition of mycobacterial lipids in the lesions of murine leprosy, we made some observations on the numbers and distribution of cutaneous mast cells that we would like to share with the readers of the JOURNAL. Mycobacterium lepraemurium (MLM), the rat-leprosy bacillus, is structurally a highly complex microorganism. A great deal of its complexity resides in its lipidic envelope that makes this and other pathogenic mycobacteria highly resistant to the hostile microenvironment found within the host phagocytic cells. Since this lipidic envelope plays a critical role in the intracellular survival of mycobacteria, this laboratory started a series of studies on the lipids of MLM to get insight into their composition, structure, and biological effects on certain manifestations of the host's immune competence. In this first study, the lipid families that accumulate in the bacilli-laden macrophages of the granulomas found in the skin, liver, and spleen of mice bearing a 4-6 month infection with MLM, were investigated. For the study, tissue fragments were embedded in O.T.C. compound (Miles laboratories, Naperville, Illinois, U.S.A.), quickly frozen on dry ice, sectioned in a microtome cryostat (Tissue-Tck II; Miles) set at - 25°C, and the sections (6-8-^m thick) air-dried and preserved unfixed until stained. Standard stains included hematox-ylin-eosin for general histology (9), Ziehl-Neelsen for acid-fast bacilli (9); Sylvcn (7), alcian blue (14), and orccin-giemsa (10) for mast cells; Rio-Hortega's and Mallory's stains (10) for reticular fibers and collagen, respectively; and the following stainings for lipids: oil red (9) and Hale's (11) stains for neutral fats; Landing's stain (10) for choline-containing lipids and cerebrosides; Feyrter's stain (11) for acidic lipids and glycolipids; DMAB-acryflavine (1) for sulfatidcs; Klu-ver-Barrera's stain (8) for phospholipids and gangliosides; and the plasmal reaction (8) for lipids with acetal groups. 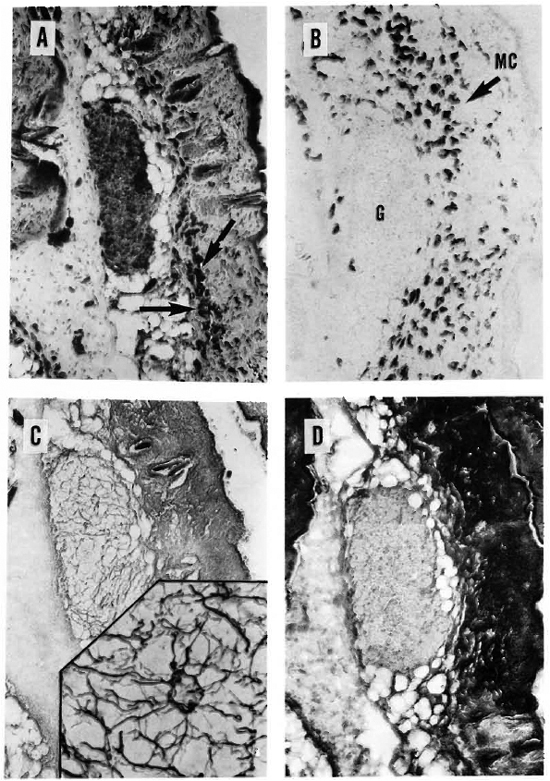 In a pioneering study by Sakurai and Skinsnes (13) on the histochemistry of lipids in murine leprosy, it was found that the major lipid components were phospholipids, fatty acids, and firmly bound lipids. Neither neutral lipids nor cholesterol were demonstrated. In the present study, cerebroside-like lipids (glycolipids), phospholipids and neutral fats (in decreasing order) were found in the leprous granulomas. Stains for plasmalogens (neutral lipids and certain phospholipids), unsaturated lipids and neutral fats using Sudan black stain were but weakly positive. Sulfatides and acidic lipids were not detected. Similar results were found in the granulomas of liver, spleen and the skin (Fig. 1). That lipids were of bacterial origin or bacterial-associated lipids was deduced from the lack of nonspecific staining in regions of the liver or spleen parenchyma other than the granulomas. The results were not very different from those reported by Sakurai and Skinsnes (13). However, the inclusion of skin in this study allowed us to observe two previously unrecognized (or neglected) aspects in murine leprosy: a) the disappearance of lipids from the subcutaneous fatty layer, and b) a remarkable increment in the number of cutaneous mast cells; both findings linked to the mycobacterial infection of the dermal tissue (Fig. 2). While the diminution of lipids from the fatty layer can be related to biosynthesis of mycobacterial lipids (after mobilization and recycling) or simply be the cachectical consequence of more general metabolic disorders in the infected animals, the increase in the number of cutaneous mast cells (CTMC) deserves further consideration. Fig. 1. A section of skin from a 6-month MLM-infected mouse stained for phospholipids. Notice localization of small granulomas (G) in the subcutaneous fatty layer (FL) which by this time of infection no longer stains for any type of lipid (Kluver-Barrera x 125). Fig. 2. A = A section of normal skin (lower right) and of a MLM-infcctcd mouse (upper left). While a well-developed fatty layer (FL) is the predominant feature of normal skin, MLM-infected skin shows a virtual absence of fat at the FL region but a high amount of mast cells (arrow) concentrated mainly in the hypodermis (Feyrter x 125). B = A high magnification of the mast cells in A, clearly showing their granular cytoplasm. Degranulating mast cells were frequently found in the MLM-infected skin. High CTMC counts in human leprosy have been reported previously (5), and have been associated with increased cellular activity in the lesions. It has been suggested that CTMC play a prominent role-in the repair of damaged connective tissue in many fibrotic conditions, including leprosy. In the mouse, a factor has been found in fibroblast-conditioned medium that stimulates the proliferation and differentiation of bone-marrow mass cells (BMMC) and of the less differentiated mast-cell committed progenitors (MCCP) into cells with the characteristics of CTMC (4,8). It is possible that CTMC in MLM-infected mice might proliferate from MCCP or from BMMC in response to fibroblast-derived factor(s). In turn, since CTMC contain a variety of biologically active substances, they might provide factors required by proliferating tissues. It has been observed that fibroblasts co-cultured in the presence of BMMC that were proliferating in response to interleu-kin-3 (IL-3), overgrew in some dishes and increased their rate of biosynthesis of proteoglycans and collagen (2). One of the mast-cell-derived cytokines (GM-CSF, IL-3, IL-4, IL-5, IL-6, or some other) (3,12,16) might possibly sustain the multiplication of fibroblasts and the accumulation of extracellular matrix. 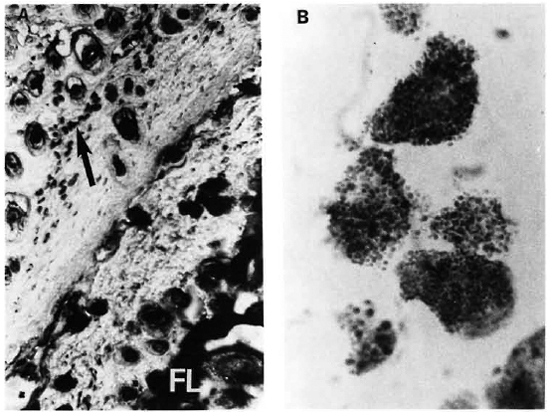 In 1985, Kumar wrote, in relation to the proliferation, high counts and morphological changes of mast cells observed in the histoid variety of leprosy (5): ";Since we do not know the actual function of mast cells, it is difficult to evaluate the significance of their proliferation, increased population and degranulation. . . ."; It is only recently that the role of mast cells, other than the one related to immediate hypersensitivity, began to be understood. In a short but updated review on mast cells, Stevens and Austen (15) discussed some new findings on the molecular biology of mast cells and their interactions with fibroblasts through diverse cytokines. from their own (and others') data, a sequence by which IL-3-activated mast cells may promote fibrosis and tissue repair was suggested. IL-3 stimulates the growth of early progenitor cells in bone marrow, and it also promotes the growth of relatively mature basophils and mast cells, suggesting that these cells in the circulation could retain IL-3 receptors (6). Our results on the association between high CTMC counts in the skin of mice with dermal lesions and the presence of significant numbers of reticular (collagen type III) fibers in the granulomas amid the bacilli-laden macrophages (Fig. 3 A-D), support the sequence of events suggested by Stevens and Austen (15). 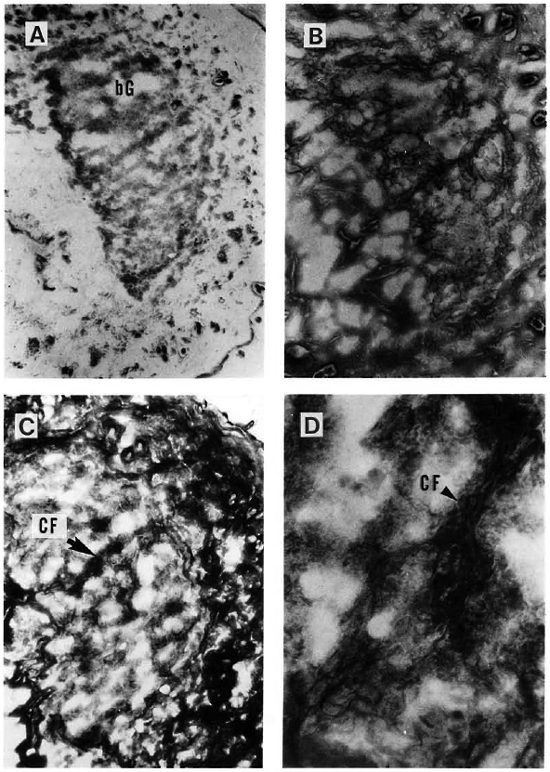 In the more advanced stages of the infection, reticular fibers in and outside the granulomas are replaced by collagen fibers, emphasizing the fibrotic reaction of the tissue (Fig. 4 AD). In a longitudinal study on the dermal changes that follow the intravenous inoculation of mice with 1 x 107 MLM, distinctive alterations (edema, monocytic infiltration up to and beyond the subjacent muscular layer, and early fibrosis) were observed only until the evidences of skin infection appeared (bacilli in isolated macrophages or in discrete granulomas). The alterations were progressive until the end of the study, 4 months after inoculation. It is noteworthy that although granulomas eventually affect the whole dermis, the incipient organized granulomas first appear located precisely within the fatty layer underneath the dermal structures (Fig. 1). This, again, suggests that microbial lipids might originate from recycled lipids of the host. Fig. 3. A = A 6-month-old, MLM-induced granuloma stained for acid-fast bacilli. Notice subcutaneous localization of highly bacilliferous granuloma and large amount of mast cells (arrows) in the hypodermis (Ziehl-Neelsen x 125). B = A section adjacent to A specifically stained for mast cells. Notice large amount of mast cells, practically the whole dermis but concentrated in the hypodermis. Mast cells arc seen peripheral to but not inside the granuloma (G) (Sylven x 125). C = Great amount of reticular fibers of neoformation are seen in the granuloma of a dermal section adjacent to B (Rio-Hortcga x 125). Insert shows a x500 detail of the reticular net. D = Dermal section adjacent to C, showing the absence of collagen fibers inside the granuloma (compare with results in Fig. 4 C and d) (Mallory x 125). Fig. 4. A = A cutaneous granuloma (G) from a mouse with an 8-month infection with MLM. Compared to the granuloma depicted in Fig. 3, this is an older and larger one (Ziehl-Neelsen x 125). This older granuloma now contains relatively few reticular fibers (B) but a large amount of collagen fibers (C). A x 500 magnification of C showing collagen fibers within the granulomas is illustrated in D.
Although these observations can account for the increased numbers of CTMC in the lesions of human and murine leprosy, in the mouse the high counts of CTMC not necessarily bound to dermal granulomas need additional explanation: since bone marrow contains fibroblasts (among other mature cells and precursors) and it is very susceptible to infection by MLM, it is possible that the above-mentioned cell interactions (through the several soluble factors and cytokines involved), occurring locally in this organ, would result in the differentiation, proliferation, and activation of MCCP which, upon acquisition of the CTMC-phe-notype, would leave the bone marrow to home in to the dermal tissue. Alternatively, relatively mature circulating CTMC (still retaining receptors for IL-3) might be activated in the tissue by fibroblast-derived factors and/or lymphokines IL-3, IL-4), as has been suggested for basophils (6). - Elba Reyes Maldonado, Sc.Dr. Acknowledgment. We deeply appreciate the help received from QBP. Antonina Okra, QBP. Patricia Méndez, Dra. Irma de Leon Rodriguez, and Dr. Sergio Estrada Parra. Wc are also indebted to Dr. Juan Ruiz Gomez and Dr. Carlos Villagran from the Laboratorios Nacionales de Salud, S.S. México, for providing us with the pathogen-frec NIH mice used in the study. Financial support was from the Dirección de Estudios de Posgrado e Investigación, I. P. N. (Proyect: ";Estimulación de actividad supresora intralesional en ratones preinoculados con Mycobacterium lepraemurium muerto por calor,"; DEPI-901741). O. Rojas-Espinosa holds fellowships from COFAA (IPN) and from the Sistema Nacional de Investigadores (SNI), Mexico. 1. Adams, C. W. M. and Bayliss, O. B. Acryflavine-DMAB method for sulfatides. In: Techniques of Biochemical and Biophysical Morphology. Glick, D. and Rosenbaum, R. M., cds. New York: John Wiley and Sons, Inc. 1975, vol. 2, p. 143. 2. Dayton, E. T., Caulfield, J. P., Hein, A., Austen, H. F. and Stevens, R. L. Regulation of the growth rate of mouse fibroblasts by IL-3-activated mouse bone marrow-derived mast cells. J. Immunol. 142(1989)4307-4313. 3. Ihle, J. N., Keller, J., Oroszlan, S., Henderson, L. E., Copeland, T. D., Fitch, F., Prystowsky, M. B., Goldwasser, E., Schrader, J. W., Palaszynski, E., Dy, M. and Lebel, B. Biologic properties of homogeneous interleukin 3. I. Demonstration of WEHI-3 growth factor activity, mast cell growth factor activity, P cell-stimulating factor activity, colony-stimulating factor activity, and histamine-producing cell-stimulating factor activity. J. Immunol. 131(1983)282-287. 4. Jarboe, D. L., Marshall, J. S., Randolph, T. R., Kukoua, A. and Huff, T. F. The mast cell-committed progenitor. I. Description of a cell capable of IL-3-indepcndent proliferation and differentiation without contact with fibroblasts. J. Immunol. 142(1989)2405-2417. 5. Kumar, R. Mast cells in histoid lepromatous leprosy. Hansenol. Int. 10(1985)1-4. 6. Kurimoto, Y., de Weck, A. L. and Dahinden, C. A. Interleukin 3-dependent mediator release in basophils triggered by C5a. J. Exp. Med. 170(1990)467-479. 7. Lagunoff, D. Toluidinc blue method. In: Techniques of Biochemical and Biophysical Morphology. Glick, D. and Rosenbaum, R. M., eds. New York: John Wiley and Sons, Inc., 1975, vol. 2, p. 143. 8. Levi-Schaffer, F., Dayton, E. T., Austen, K. F., Hein, A., Caulfield, J. P., Gravallese, P. M., Liu, F.-T. and Stevens, R. L. Mouse bone marrow-derived mast cells cocultured with fibroblasts; morphology and stimulation-induced release of histamine, leukotricne B4, leukotriene C4, and prostaglandin D,. J. Immunol. 139(1987)3431-3441. 9. Lillie, R. D. and Fullmer, H. M. Histopathologic Technic and Practical Histochemistry. New York: McGraw-Hill Book Co., 1976, pp. 208-210, 565-568, 582, 735-736. 10. Luna, L, G., ed. Manual of Histologic Staining Methods of the Armed Forces Institute of Pathology. 3rd cd. New York: McGraw-Hill Inc., 1968, pp. 77, 145-146. 11. Pearse, A. G. E. Histochemistry, Theoretical and Applied. 3rd ed. London: J. & A. Churchill Ltd., 1968, vol. 1, pp. 700, 704. 12. Plaut, M., Pierce, J. H., Watson, C. J., Hanley-Hyde, J., Nordan, R. P. and Paul, W. E. Mast cell lines produce lymphokincs in response to cross-linkage of Fe RI or to calcium ionophorcs. Nature 339(1989)64-67. 13. Sakurai, I. and Skinsnes, O. K. Lipids in leprosy. 1. 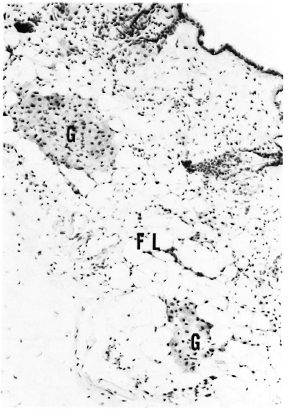 Histochemistry of lipids of murine leprosy. Int. J. Lepr. 38(1970)379-388. 14. Sheehan, C. and Hrapchak, B. B. Theory and Practice of Ilistotechnology. 2nd ed. St. Louis, Missouri: The C. V. Mosby Co., 1980, pp. 172-173. 15. Stevens, R. L. and Austen, K. F. Recent advances in the cellular and molecular biology of mast cells. Immunol. Today 10(1989)381-386. 16. Wodnar-Filipowicz, A., Heusser, C. H. and Moroni, C. Production of hacmopoictic growth factors GM-CSF and interlcukin-3 by mast cells in response to IgE receptor-mediated activation. (Letter) Nature 339(1989)150-152.